Pirates of the Caribbean ‘Dead Men Tell No Tales’: Official Trailer #3 & New Poster! The search for legendary Captain Jack Sparrow has mounted to a fever pitch as Captain Salazar intends to destroy anything in his path. Some old memories may come back only to bite Sparrow where it hurts most… the seas! Last month, a thrilling trailer for the upcoming fifth installment of Pirates of the Caribbean had you on the edge of your seat as it revealed some new and familiar faces. Accompanied with those faces was the stories of the deep arising from the wavy grave in the former of Captain Salazar and his undead crew. 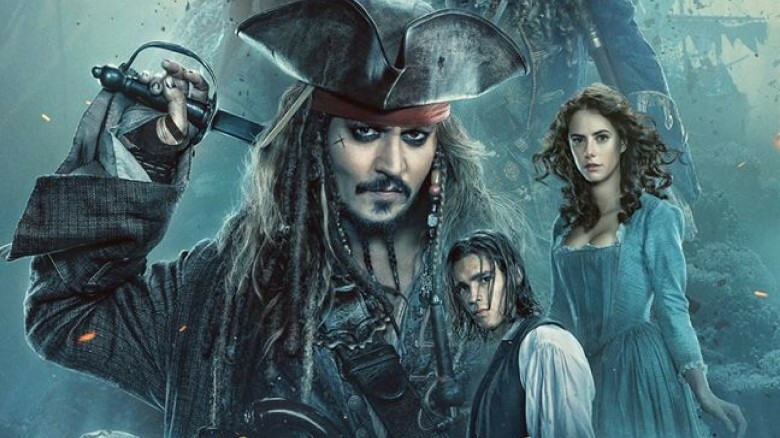 Earlier Wednesday, Disney had released a brand new poster and concept art illustration to get fans ready for Pirates of the Caribbean: Dead Men Tell No Tales’ latest trailer. Today, the new trailer packs the pirate adventure that we grew to love. From the mysterious supernaturalistic powers that the sea holds to the origins stories of how “a boy… stole everything…” from Captain Salazar. The devious Salazar wanted to rid the world of pirates but met an end… or so Sparrow thinks when he commands the seas with his ghastly crew looking for vengeance. The trailer does get you excited as it has pieces of the first film mixed with various parts from the sequels (‘Dead Man’s Chest’ & ‘At World’s End’). The new poster features a devious look at Captain Salazar (Javier Bardem), along with Captain Jack Sparrow (Johnny Depp), Captain Barbosa (Geoffrey Rush) along with a couple of new faces Carina Smyth (Kaya Scodelario) and Henry (Brenthon Thwaites). An interesting part of this poster is close to the bottom where it appears to be ghost sharks. Disney would also reveal concept art featuring these ferocious creatures likely having a prominent role in the movie. Pirates of the Caribbean: Dead Men Tell No Tales will star, Johnny Depp as Captain Jack Sparrow, Javier Bardem as Captain Salazar, Kevin R. McNally as Joshamee Gibbs, Golshifteh Farahani as sea-witch Shansa, Stephen Graham as Scrum, David Wenham as Scarfield and Geoffrey Rush as Captain Hector Barbossa. Espen Sandberg & Joachim Ronning will be directing as Jeff Nathanson has written the script. Jerry Bruckheimer serves as the producer and Mike Stenson, Chad Oman, Joe Caracciolo, Jr. and Brigham Taylor are the executive producers. ‘Pirates of the Caribbean: Dead Men Tell No Tales’ sails into theaters on May 26th.